The first era of muscle cars started in 1964 with the release of the Pontiac GTO. The formula was to put a big V-8 in a smaller body car. Soon Ford, Chevy, and later Chrysler joined in. The original muscle car era reached its peak in 1970 with the Ford Boss 429 Mustang, the Chevy 454 SS Chevelle and the Dodge 426 Hemi R/T Challenger. After 1970 some serious EPA restrictions for emissions kicked in, and the muscle car went downhill. Manufacturers had to add catalytic converters and work with unleaded fuel. By 1975, even the mighty Corvette standard engine had less than 200 horsepower. The once-proud Mustang GT's V-8 was replaced by an anemic four-cylinder and was renamed the Mustang II in 1974. A standard engine 1.8-liter VW Golf today would dust a 1978 Pontiac Trans Am big block 0 to 60 MPH. Your grandma’s Toyota Avalon would easily do the same. It was a sad time for car enthusiasts. Fortunately for us car nuts, we are in the midst of a second heyday for the muscle car. Engineers have figured out how to meet emissions requirements and still give us the power we want. 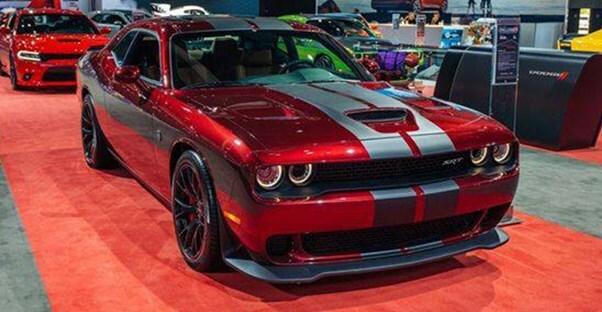 For 2017, we can buy a 526 HP Ford Shelby Mustang GT350, a 650 HP Chevy Camaro ZL-1, and a 705 HP Dodge Hellcat Challenger. The tire smoke is back, baby! And it’s better than ever. Modern muscle cars not only have cleaner emissions, but they're better in nearly every respect. They're considerably faster, safer, and get better gas mileage compared to the muscle cars of the past. So how do our high water mark cars from the old-school muscle car era stack up to our present muscle? According to Car and Driver magazine, the new Shelby Mustang GT350 goes from zero to 60 MPH in 4.3 seconds. The Chevy Camaro ZL-1 does it in 3.5 seconds, and the Dodge Hellcat Challenger does it in 3.6 seconds. The old Boss 429 Mustang did zero-60 in 6.9 seconds, the Chevelle 454 SS in 5.3 seconds, and the 426 Hemi R/T Challenger did it in 5.2 seconds. The new muscle cars easily win a drag race. And they are much better at taking curves than the older muscle cars, which were made for mostly straight line driving. The new golden age of muscle cars may not last forever. If you have the money and can afford the higher insurance cost, our current low gas prices mean that now may be the best time to get a muscle car. Maybe you can’t afford the top-of-the-line Hellcat or Shelby Mustang, but you can find a lower horsepower version with a V-8 for thousands less—and well under the sticker price if you know how to bargain. Phil is a special contributor, member of the developer quality assurance team, and life-long car enthusiast. Which 2017 Ford Mustang is For You? Which 2017 Chevrolet Camaro is Right for You?